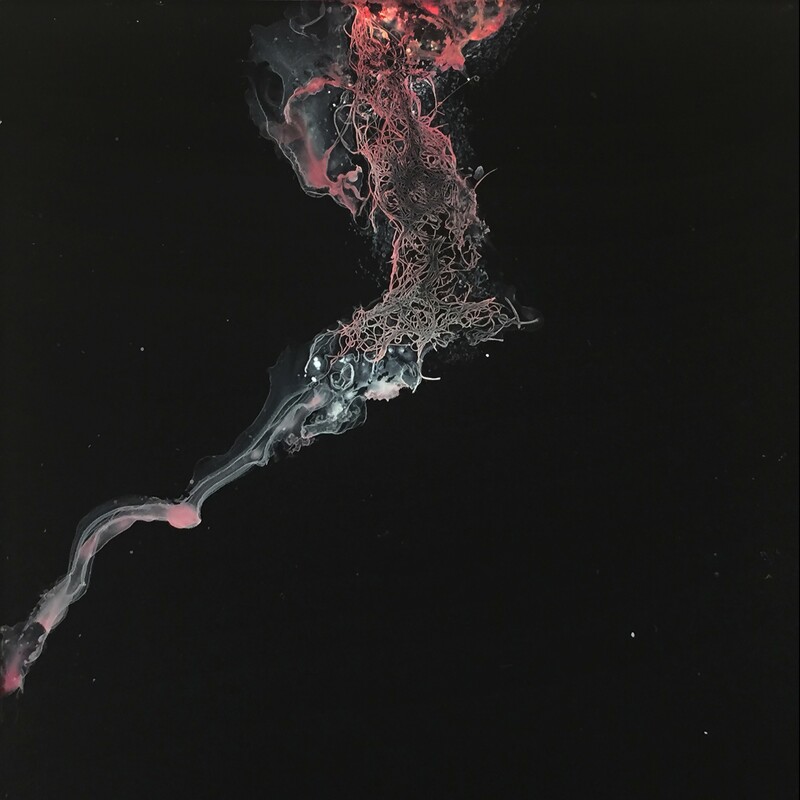 Gallery O Art Space recently opened its doors to a Group Show of eight artists titled “Another Matter”. This was the second Show to exhibit the work of fresh graduates. Previously a Group Show titled “Forecast” which was also held at Gallery O Art Space consisting of eight artists, had showcased the work of NCA graduates. “Forecast” had offered an experience where artists ruminated over concerns that characterized their life, everyday surroundings and society. Artists dwelled upon the fragility of human relationships, memory, contested identity and domestic anxieties. The expectations from the work of upcoming artists, particularly recent graduates are both demanding and varied. They are on the threshold of making inroads into the world of galleries, curators, Residencies, market demands and what-have-you where they will continue to oscillate and struggle between conformity, productivity and self-discovery till they find their path and place. Shows such as “Another Matter” and “Forecast” are therefore refreshing for they are landmark events in the fledgling careers of these artists. They mark the nascent rise of a new batch of art practitioners. Yet at this moment they are also most vulnerable: the desire to be earnest, enthusiastic and thoroughly engaged and to woo us with an experience that, as John Berger puts it in his Introduction to Permanent Red grants an epiphany of sorts through “an increase in our awareness of our own potentiality” is most compelling at this juncture. While the struggle to present viewers with such an experience was quite evident in the Show and one must recognize their initial effort as the equivalent of a brave new start, many of the works did also attempt to ground themselves with an informed awareness of historical discourse as well as experimentation with materiality and its possibilities. Charcoal, ink, gouache, collage, gold leaf and even human hair was used as a medium. Sabeen Ahsan’s “Scattered Ruminations” for example, straddled both minimalism and abstract expressionism and stood out for its scale and composition. The non-illusionistic composition executed using carbon paper, transfer ink and gouache on paper recalled the remnants of a fragmented grid where pale, flesh-coloured hues contrasted with somber rectangular greys. The geometry of the composition was offset and softened by a flurry of mark making and textures in an all-over fashion across the surface. 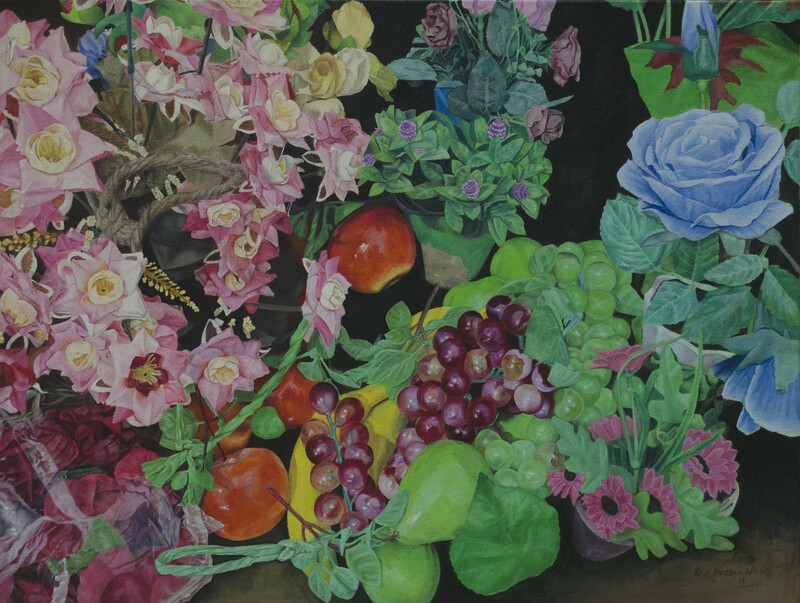 While wilting flowers, bees and flies-motifs that represented the inevitability of death- did not inhabit the Dutch-inspired still lifes of Rao Hassan Nasir, he had grasped the moral message underpinning their symbolism. To reference the dilemmas that characterize modern society today Nasir had deliberately chosen to copy from arrangements made of plastic- a material that is both cheap and disposable. The cropped and enlarged closeups coupled with their sickly and artificial colour palette alluded to kitsch and the pervasive culture of convenience and consumption in a modern society where the imaginary and illusory is preferred to the real. Bilal Khalid’s understanding of death was shaped by a childhood spent playing in a graveyard and his work drew from fragmented memories of that experience. His monochromatic images of burial mounds meticulously executed in charcoal on a black background were solemn, quiet and transformative. Devoid of context and specificity they became effortlessly rendered studies in form and contour. Aliha Ahmed Qureshi’s incorporation of hair in the gilded floral borders of her composition presented a unique reinterpretation of human presence in her miniature compositions. Her dark ruminations on pain, mortality and death also paved the way for colonial discourse in a composition executed in gouache. Two embroidery hoops and their point of intersection became the nucleus of contested identity: as flies and butterflies preyed upon the pell-mell of flowers and various Victorian embroidery motifs alluding to colonial legacy embedded in the center, the gold interlace geometric design synonymous with Islamic art shown through the hoops. Sehrish Mustafa’s work was notable for she had used glass as her canvas while the balance of space and form was deftly handled in her abstract compositions. Pared down to single, meandering dribbles, drips and translucent layers executed on a black surface, the work shone with its delicacy and had a luminous quality that did not deter one from its frail vulnerability. Both Shahid Altaf Malik and Zarina Khan had explored dystopian landscapes albeit their content was anything but similar. Shahid Altaf Malik had contested the history of landscape painting and miniature painting in particular which, historically, had in the past functioned to record many idyllic scenes of verdant gardens full of flora and fauna. 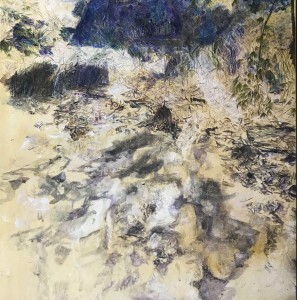 Malik’s landscapes though drew attention to contemporary concerns such as global warming, overpopulation and the role of man in postmodern society. Canonical tropes such as the curling hills typical of Persian miniatures and pristine blue skies of western landscape painting were merged with the presence of landfill zones and waste sites. The subtle incorporation and transformation of these landscapes was both unnerving and thought provoking. 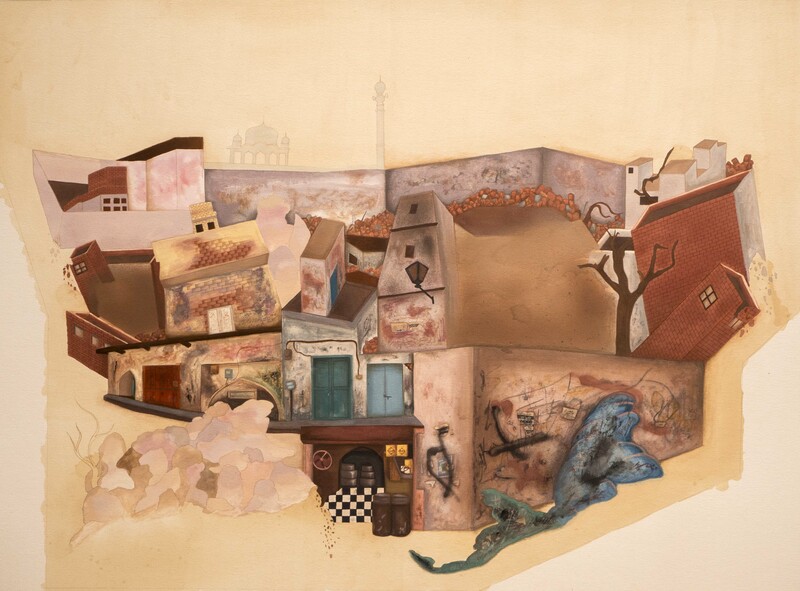 Zarina Khan’s views and mapping of the city, true to the tradition of rendering unique, multiple, planar perspectives that is so characteristic of miniature painting was given a lease of new life as she drew attention to the presence of graffiti, texture and degradation the cityscape has undergone. The colour palette of earth colours and experimentation with texture was both skillful and engaging despite the melancholic undertone of the work. Fizza Hussain had explored wavering shadows, dappled light and shifting spaces hidden within landscapes. The works had an almost hallucinatory quality to them. 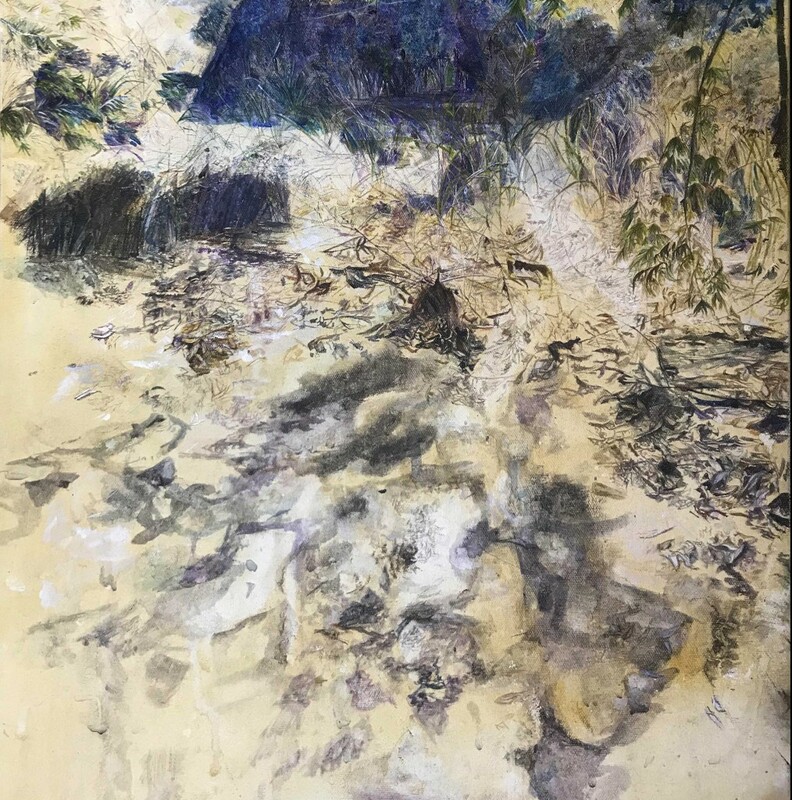 Executed in mixed media, they offered a transitory experience where linear and textural exploration balanced by space took precedence over actual representational imagery. “Another Matter” opened on 13th July 2018 at Gallery O Art Space.